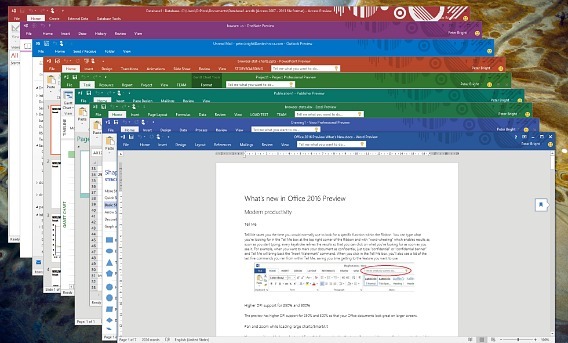 Office 2016 Preview includes Word, Access, Excel, Lync (Skype for Business), OneNote, Outlook, PowerPoint, Publisher, OneDrive for Business, Visio, Project, and Project Server 2016. Like its predecessor Office 2013, Office 2016 Preview is requires Windows 7 and later. The main differences between Office 2016 Preview (for Home) and Office 2016 Preview (for Business) is that Business edition contains only Office 365 ProPlus, which aimed at IT professionals and developers, and comes with various XML files for IT administrator to customize deployment in their environment. Meanwhile, Home edition allows users to instantly install Office 2016 Preview right away, with options to install Office 2016 for ProPlus, Home (or Home Premium which lacks Lync client) or Business Premium (or Small Business Premium which lacks Access and Lync client). Data Loss Protection for Word, Excel and PowerPoint – allows IT administrators to secure Office documents through centralized sharing and authoring policies. It now comes with Word, Excel and PowerPoint which previously only available for Exchange, Outlook, OneDrive for Business, and SharePoint. Theme – new dark theme for those who wants a change with their traditional look of Microsoft Office apps. Outlook technical improvements – improvements email software, including multi-factor authentication support, additional storage options, faster overall performance, and more reliable search. Emails Delivery Performance – To cut short the amount of time in download messages, display message list, and show new email after resumed activity from hibernation. Search – Enhanced for more usability, reliability and performance of Outlook search. Also, the FAST-based search engine is now integrated in Exchange. New deployment features – IT pros can take advantage of new bandwidth management features, more flexibility for updates, and manage device activations across multiple users. Accessibility – better keyboard accessibility like PivotTables and Slicers for Excel. A number of readability issues in Outlook also have been modified and fixed. Information Rights Management – allows users to lock down documents against editing or sharing, and extended to Microsoft’s flowchart software. The preview is currently aimed at IT professionals and developers, and it requires an active Office 365 subscription. The supported Office 365 subscription includes Office 365 Personal, Office 365 Home (Home Premium), Office 365 Business, Office 365 Business Premium (Small Business Premium), Office 365 ProPlus, Office 365 Enterprise E3 and Office 365 Enterprise E4 (ProPlus). In addition, the active subscription for Visio or Project is also required for installing Visio 2016 or Project 2016. For users those want to try out and install Office 2016 on Windows, they can download from Microsoft Connect website. Head over Connect site [ Office 2016 Preview (for Home) , Office 2016 Preview (for Business) ] to sign up and enter email address to receive an invitation to participate in the preview. However, bear in mind that you’ll be bound by an NDA (Non-Disclosure Agreement). UPDATE: A new version 16.0.3823.1010 of Office 2016 Preview is available for download and update. To update to the new version, go to File -> Account page and click on Update Options -> Update Now option.